Based on user feedback, the following are recent changes and updates we have made to ShopKey Pro. The ShopKey Pro Team is back with multiple software and editorial improvements in the latest ShopKey Pro auto repair information software update. As always, we've listened to your feedback and made updates all based on the best ideas from our users. Improved 1Search Results Display: Our 1Search results page has been simplified to show the "OEM Plus Results" and the "SureTrack Results" side-by-side in two easy-to-view columns. ShopKey Pro also now returns "Additional Results" that include keyword search results from the Service Manual module. This means that after performing a 1Search, users will also find results when that key term is mentioned anywhere in our collection of OEM data, giving you immediate access to everything we know about that search term for the selected vehicle. An example of this new layout is shown in the screenshot below for the search "Oil". Improved Common Repair Procedures Graph: As part of the real-world SureTrack diagnostics information, the Common Repair Procedures Graph has been updated to have higher resolution for easier viewing. Also, instead of reporting component replacement instances at 25,000 mile intervals, we’ve shortened this to 10,000 mile intervals. 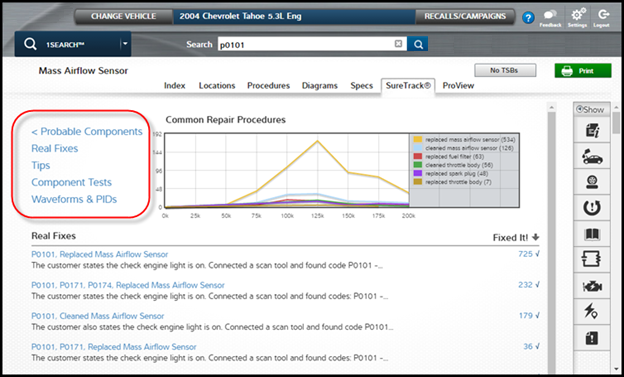 This change allows technicians to see a more true analysis of when components are replaced based on our database of actual repair records. In Figures 2 and 3 below, you can see example screenshots showing the "before and after" view of mass airflow sensor data. In Figure 3, the "after" view, you can see more clearly the spike in mass airflow sensor replacements at 90,000 miles. It’s a much more detailed view, giving you more pinpointed diagnostic information. Codes and Systems for Non-SAE Codes: For the first generation of codes (OBD-I) in vehicles, you would often find the same code in different systems in the vehicle. ShopKey Pro now returns smarter results for these codes, giving you a return choice with additional information, allowing you to select the correct code for your situation. In addition to OBD-I, many European and Asian vehicles contain non-standard codes for various systems throughout the vehicle, including engine and restraint systems. An example of this would be BMW hex codes, such as "0x2a15", representing an evaporative emissions systems leak. In total, our editorial staff enriched 240,000 procedures representing 21,000 non-standard codes throughout all of the vehicles covered in ShopKey Pro. 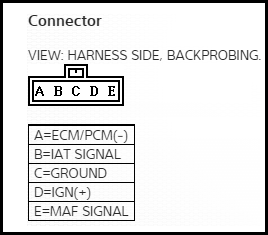 Connector End Views: Our editorial team recently finished a project to add connector end view diagrams into ShopKey Pro for all vehicles covered from 2002 to present. In conjunction with wiring diagrams and test procedures, the connector end view diagrams allow technicians to properly diagnose a component. Especially for insulated connectors, the connector end view diagrams give technicians an easy way to know which pin is correct for the wire, allowing them to run electrical diagnostic testing such as voltage or resistance testing. The connector end view diagrams can be found in the "Diagrams" tab within the 1Search Module. Estimate Guide Category Descriptions: We have fixed an issue related to spatial descriptive terms such as front/rear. ShopKey Pro now includes these descriptions in the categories in the Estimate Guide Module, making service writing more straight-forward for those affected labor and part items. Forgot Username and Password Links: If you’ve forgotten your username or password, we have a quick solution. Using self-service links on the login screen, ShopKey Pro now allows users to view their username and reset their password without having to call into our tech support group. The leaderboard feature of the SureTrack Community now keeps track of top point scorers (based on asking, replying to, and answering community questions) on a 30-day rolling basis. You can now link to examples of good community tips/questions from the entry form for the tips/questions, making it quick and easy to see examples for how to write an effective posting. More detailed explanations are accessible throughout the SureTrack Community to help you navigate and post within the community. The SureTrack Community module gives an indication if you have an open question so that you can close the question with the best answer. Contact Us/Feedback: ShopKey Pro Feedback has been replaced with a "Contact Us" button found at the top right of the screen. Clicking on "Contact Us" gives users support options including our toll-free support contact line at 888-724-6742. This is also where you can provide feedback regarding your user experience with ShopKey Pro. How do I search for a symptom or a code? How do I access Real Fixes? How do I access Component Tests? How do I access the Waveform Library? The search function is located in our 1Search module. When you first log in to ShopKey Pro, after selecting Year-Make-Model, ShopKey Pro will drive you to the 1Search module. 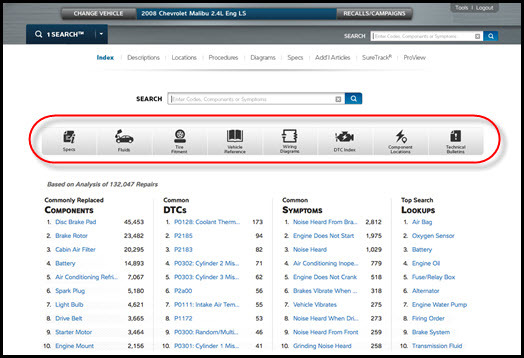 If you are in the SureTrack Community module, you can access the 1Search module by using the module list on the left side of the page. First, you must be in the 1Search module. Then you search for a symptom, code, or component by typing your information into the search bar. You'll be directed to land on the search results screen that displays a list of Probable Components. Select a probable component to go directly to Real Fixes (and the SureTrack tab). Once you've landed on the SureTrack tab (after entering your search term in 1Search and selecting a probable component), you will see links to the component test specific to that component on the left side of the screen. You will also have a link to access the waveform library. Follow the same steps as you would to access component tests - use 1search, select a probable component and land on the SureTrack tab - then select Waveforms & PIDs. See Figure 5 above. The majority of effort in this software release was focused towards the Estimate Guide module in ShopKey Pro, with improvements both to navigation and data within the module. Additionally, we've made a change to how you access our vintage information. See the list of features below for the details. Component Passed into Estimate Guide: This new feature saves time by populating the estimate with the most probable component associated with the particular DTC you have searched for in ShopKey Pro. For example, when you perform a code search in the 1Search module, and then navigate to the Estimate Guide to write a labor estimate based on your diagnosis, ShopKey Pro will automatically use the most probable component associated with that code. No more manual searching or typing the components you need to write the estimate -- the information is right there for you. Search by OEM Part Number: ShopKey Pro now allows you to search for the OEM part number using the search function in the Estimate Guide. 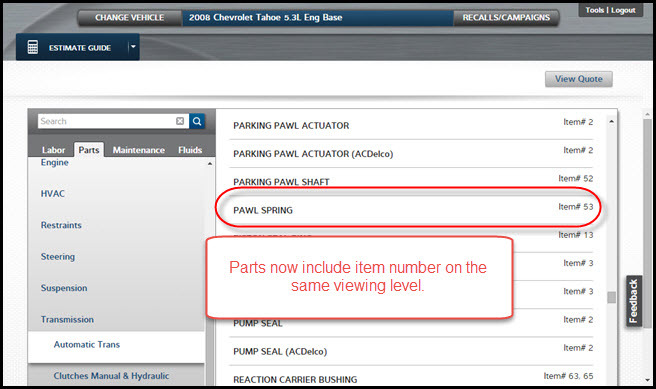 This new feature saves you time if you are starting with the part number and need to find additional information related to the part. 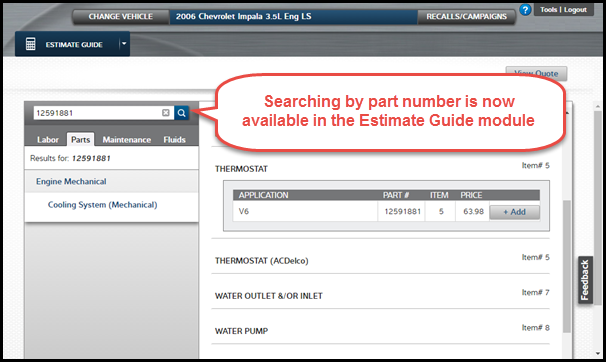 To use this feature, make sure you are in the Estimate Guide module and that you have selected the "Parts" tab in order to view "parts" results. Updated Diagnostic Estimates We've improved the diagnostic estimating function in ShopKey Prod with a more streamlined and consistent naming process for labor operations. We've also filled in gaps that may have occurred model to model. See our blog post for more details about this update. Integration of All Vintage Information into ShopKey Pro: Our entire set of vintage vehicle information is now available within the structure and format of ShopKey Pro. Simply pick your vehicle -- back to 1960 -- using the same YMM selection as you would for other vehicles in ShopKey Pro. Note: Because of this change, the Vintage module has now been removed from the module list. At ShopKey, we're always looking to improve our products so that your experience as a user is improved. A recent area of improvement in ShopKey Pro is the diagnostic estimates in the Estimate Guide module. We've reviewed our estimates, streamlined our consistency with naming the operation, and filled in gaps that may have occurred model to model. Now, you'll find a much improved experience when you want to give a diagnostic estimate. To give you a straightforward example of a diagnostic labor estimate, let's look at a 2009 Ford Mustang 5.4L Shelby GT500. If you need to diagnose the anti-lock brake system, you can look under the brake category and anti-lock brake sub-category to find the estimate for diagnosing of the anti-lock brake system (see below). We've reviewed and updated all diagnostic operations back to 1996 to coincide with OBD-II vehicles. The diagnostic estimates vary from manufacturer to manufacturer and model to model. Estimates are initially based on recommendations from the OEM, but our editorial staff at ShopKey adjusts estimates based on their own experience, knowledge of the vehicle, and repair procedures provided by the OEM. Naming has also been standardized to include only four names for the type of effort: diagnosis, check, test and analyze. All of the diagnostic estimates are based on systems, so for certain symptoms you'll have to add multiple systems together to fully cover the diagnosis. This is best explained through an example: You won't find "no start" diagnostic estimates in the product. But you can find diagnostic estimates for battery testing, checking the charging system, checking the starter circuit, ignition system tests and fuel injection system diagnostics. Taken together, you can estimate your time to diagnose the "no start" symptom. A 2005 MINI Cooper 1.6L S pulls into your shop with the check engine light on. Upon reading the code, you find a P1688 -- Electronic throttle control monitor level versus mass airflow calculation. The code set condition is because the flow of air going through the Mass Airflow Sensor (MAF) is different from the flow of air going into the throttle body. Where to start with the diagnosis? Well, common sense and experience might lead you to diagnose the MAF, suspecting a faulty sensor. But let’s take a quick look at the SureTrack data in ShopKey Pro. If you look at the Common Replaced Parts Graph, you can see that real experience in the aftermarket shows that the harmonic balancer is much more likely to be the main culprit. SureTrack is the voice of the aftermarket! What is the lesson? Not all real-world information is created equal. ShopKey Pro offers exclusive Real Fix information using a dataset of real aftermarket repair orders to save time by pointing you in the correct diagnostic direction. Mitchell 1 uses our library of 380 million repair orders (ROs) as the foundation data set of Real Fixes. If you think about it, there is no better source of information than a repair order because on each repair order you have the code/symptom that brought the vehicle to the shop, along with the corresponding component on that specific vehicle that was fixed by a professional technician. As an example, let’s look at the 2004 Chevy Impala. We have processed over 337,000 repair orders for that specific vehicle alone! And looking at our Top 10 Repairs feature (figure below), you can see that P0300, engine misfire, has happened 802 times for this vehicle. When you combine the code with the probable component list, you are well on your way to quickly diagnosing the source of the fault. No other product offers this amount of information to pull from, giving you confidence in the data to correctly diagnose the vehicle. Our database of real-world information keeps growing. Mitchell 1 sorts through the database of repair orders daily to identify valuable Real Fixes to add to ShopKey Pro. Currently we are adding over 65,000 Real Fixes to ShopKey Pro every day. This pace is much faster than other products and gives ShopKey Pro users a definite advantage that other information providers can’t match. Take a look at the chart below showing the total aftermarket Real Fixes. ShopKey Pro has a commanding lead of real-world information that will increase over time. Real-world information will continue to become more important as a source of repair information in aftermarket shops. ShopKey Pro offers the largest dataset of accurate, RO-based information available to your shop. As the example of the harmonic balancer on the MINI Cooper shows, having the right real-world information can make all the difference in quickly and accurately diagnosing the code or symptom and then completing the repair on schedule. Probable Components: The display of Real Fixes has been updated to deliver a more targeted result and save you time. Real Fixes are now grouped by "Probable Component," allowing you to see the list of components associated with the code or symptom, ranked in order from the most likely to the least likely component at fault. You also have a "more/less" link associated with the feature, allowing you to quickly see the full list of components if you wish. If you are more interested in "rare fixes" -- the ones that are not obvious, but solved the problem in some cases -- you can also invert the list of probable components to show the least common fixes first, saving you even more time. 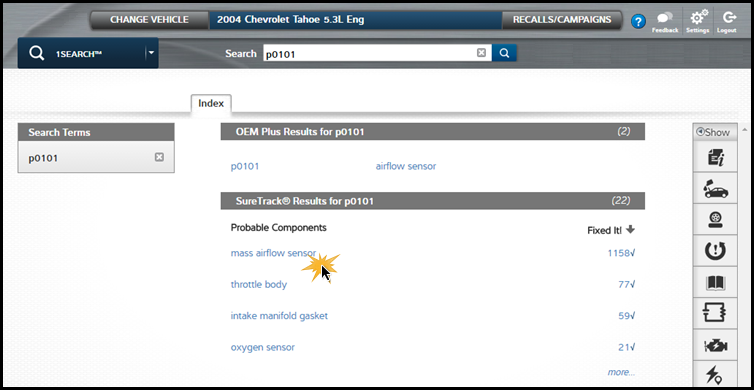 You'll see probable components in both the 1Search Results screen and the SureTrack tab. 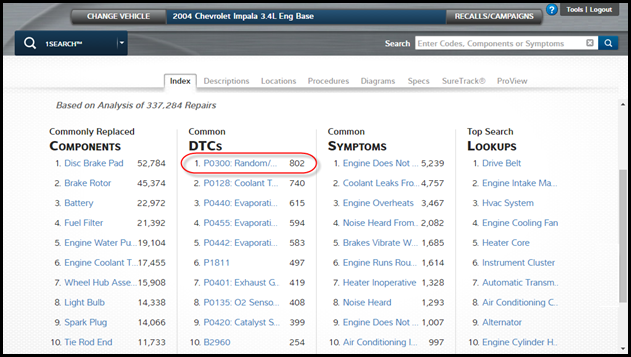 The probable component list is a major enhancement that will help you prioritize your diagnostic strategy when investigating a code or symptom. The lists are created using information from our database of over 380 million repair orders, so you can be confident you have the most comprehensive and accurate aftermarket data on your specific vehicle. Association of Codes, Symptoms and Components: After performing a search for a code or symptom, ShopKey Pro will now associate your code or symptom to the most probable component based on our Real Fix data. 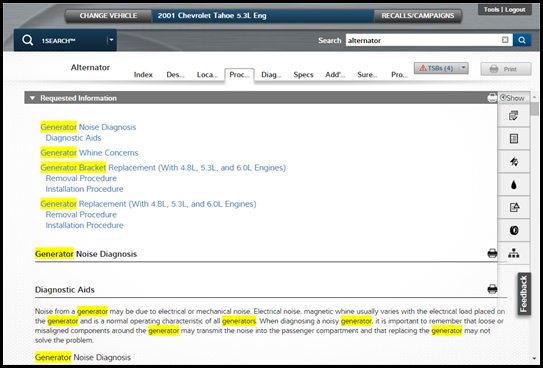 Along with the information for the code or symptom, you will also see categorized component-level repair information under the 1Search tab headings. This feature eliminates the need for an additional lookup because in a majority of cases, the top-ranked component will be the next set of information you'd want to review. Additionally, the categories below the 1Search tabs are now based on a hierarchy that flows from code to component to system. 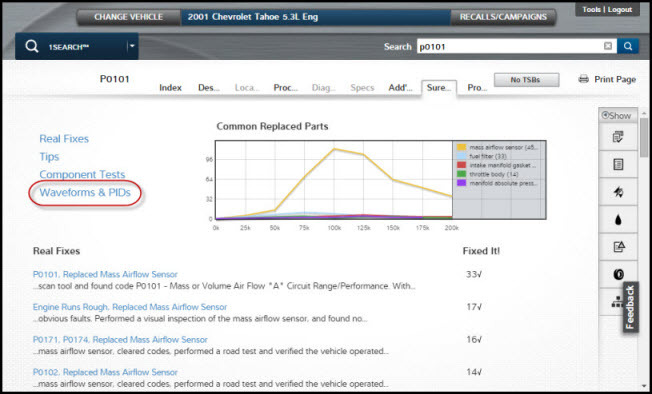 In the example shown below, a lookup of the DTC P0420 returns information for the most probable component, the catalytic converter. And ShopKey Pro goes one step further and also associates the emissions and exhaust system level data so that broader-based information is available immediately to you without another lookup. 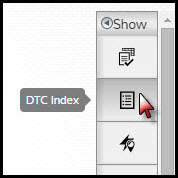 DTC Description on SureTrack Tab: Below the SureTrack information tab, you will now find the code and description (if available from the OEM). This feature is especially beneficial on the print-out, where the code is displayed across the top of your page. Integration of all Vintage Information into ShopKey Pro: Our entire set of vintage vehicle information is now available within the structure and format of ShopKey Pro. Simply pick your vehicle back to 1960 using the YMM selection as you would other vehicles in ShopKey Pro. 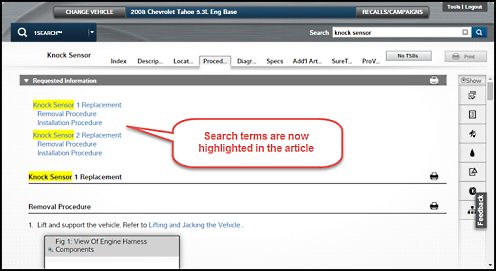 Information can be searched using 1Search or the Service Manual module. 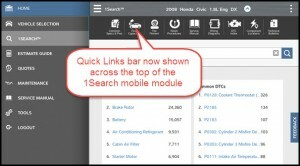 Mobile Quick Links and Service Manual: The 1Search Quick Links bar and the Service Manual module have been added to the mobile version of ShopKey Pro. As a reminder, the mobile version of ShopKey Pro is free of charge with your subscription. To use it, simply navigate to www.ShopKeyPro.com from your mobile device and follow the login procedures. The mobile version is optimized for tablets only. With the latest release ShopKey Pro, our development and editorial teams focused on improving the Estimate Guide Module. As with all of the software updates completed in 2015, this update was in response to customer feedback we've received. Please keep submitting the feedback, and we'll keep prioritizing the latest updates to improve your ShopKey Pro experience. Cab & Chassis and Cutaway labor and parts added: The ShopKey Pro Editorial staff has recently completed labor and parts information associated with the Cab & Chassis and Cutaway vehicles from 2000 to present, providing additional information to shops servicing fleets. Selected category always shows contents of that category: In the Estimate Guide Module, when you select a category located toward the bottom of your screen, ShopKey Pro will automatically scroll so that you can view the expanded contents of that category without needing to scroll yourself. Quick Links enabled according to content available: ShopKey Pro will show a Quick Link button as active only if information for the Quick Link is available for the vehicle. The primary navigation for ShopKey Pro is to use the 1Search module for finding repair information, allowing you to return all the information you need for a job with just one lookup. This post covers the key points of using 1Search to maximize your efficiency when you navigate ShopKey Pro. From the module list on the left side of the ShopKey Pro page, 1Search is the first module listed underneath the home module. 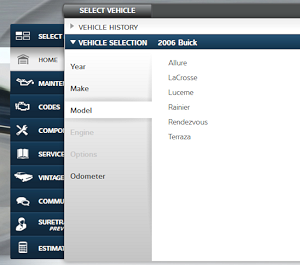 You begin by selecting the 1Search module, or by selecting the "select vehicle" button from the top of the screen. Either way you start, you'll first identify your vehicle through the select vehicle dialogue, then ShopKey Pro will automatically navigate you to the 1Search module screen. In the center of the screen, the Quick Links menu provides fast access to commonly referenced information. Click an icon to find common specifications and procedures, fluid specifications, tire fitment information, reset procedures, a link to the service manual module, all of our color wiring diagrams, a Diagnostic Trouble Code Index, component locations, all Technical Service Bulletins (TSBs). To use 1Search, begin typing in the search box. For this example, we'll lookup information for an oxygen sensor. 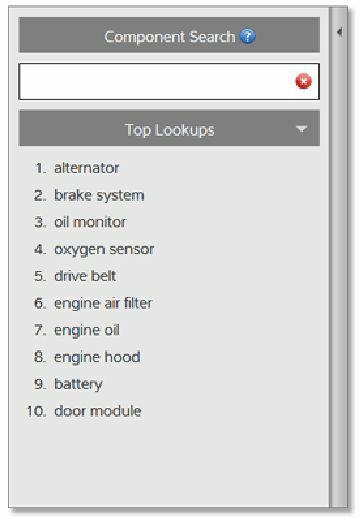 After typing "oxygen sensor" into the search box and pressing magnifying glass icon next to search, ShopKey Pro guides you to the search results page. ShopKey Pro shows the OEM search results, leading to OEM information as the first set of search results. 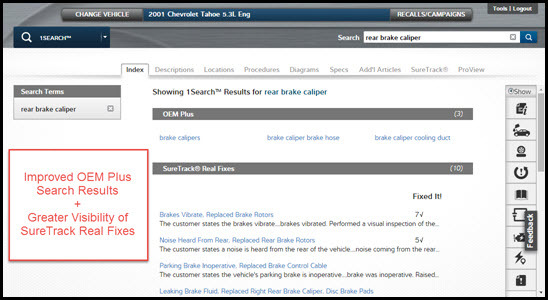 The second set of search results are the SureTrack Real Fix results, based on real-world information. 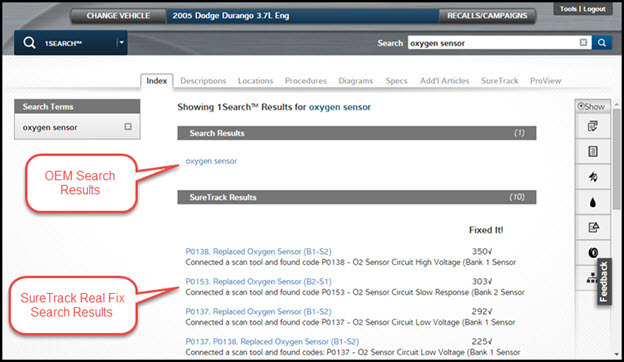 For this example, we are going to select "oxygen sensor" from the OEM search results. Also notice in the screenshot that the Quick Links bar moves to the right side of the page. It will always appear on the right side of the screen as you navigate to information. After selecting your search result, ShopKey Pro brings all relevant information to you. Across the top of the page, you can now see tabs, with bold letters, representing the type of information retrieved. This includes relevant TSBs, related to the oxygen sensor. Our dedicated diagnostics tab is SureTrack, providing real-world information integrated in ShopKey Pro. 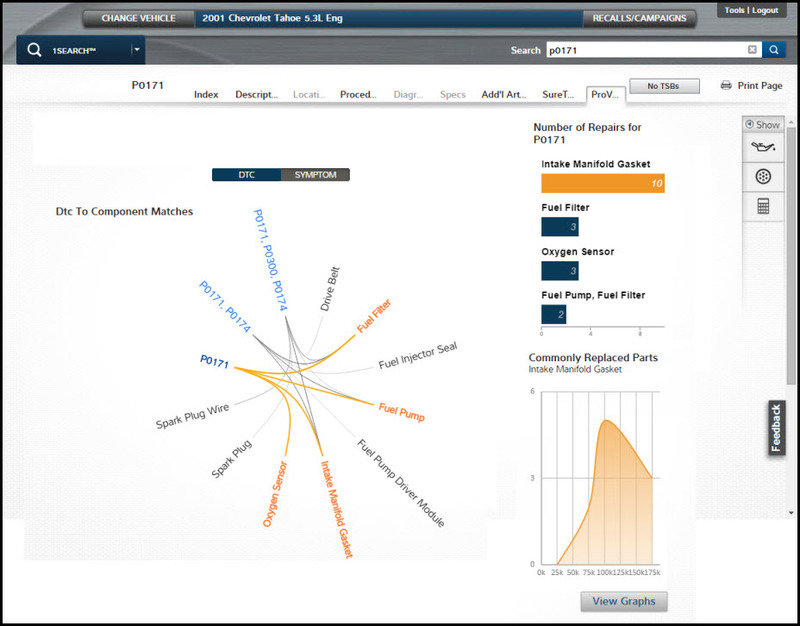 SureTrack includes common replaced parts, Real Fixes, component test information with connector end views, waveform diagrams, and a community of technicians to share information with. 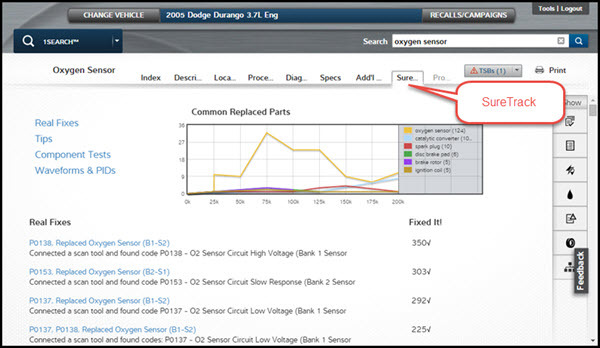 Parts Replacement graphs - Prioritize which components are most likely at fault, saving diagnostic time. Waveforms and PID graphs - Allows technicians to compare a known good or known bad graph to the test graph on their scan tool, clarifying the results of your test. ShopKey Pro is the largest database of such information with over 750,000 graphs. Community of Technicians - Share information including giving tips and asking questions with all other technicians using the system. When you are stuck on a difficult job, this offers a life-line to experts to give direction on the next step of your diagnosis. 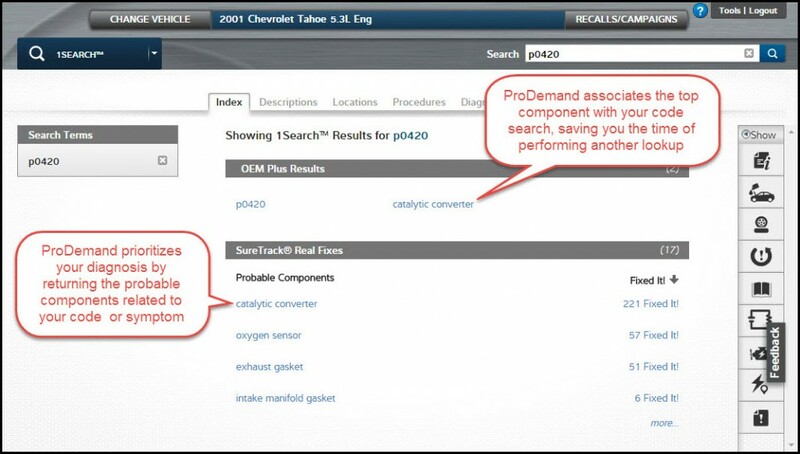 - Improved OEM search results: Through advanced data analysis, 1Search now returns results with pinpoint accuracy to save time on lookups. For example, a "rear brake caliper" lookup in 1Search now returns three precise, highly-relevant results, with "brake caliper" being the first result, compared to more than 100 results returned previously. - Greater visibility of SureTrack Real Fix results: After performing a 1Search, SureTrack Real Fixes will always be shown on the screen. The 12 most relevant OEM results are displayed, with a "more" link to expand the list, so you get the best matches first with the option to do further research if needed. - Automatic Estimate Guide Search: After performing a 1Search, when you navigate to the Estimate Guide Module, your 1Search term will be automatically entered into the Estimate Guide and searched, keeping you on the page showing that component. This change saves you time by eliminating the need to re-enter the same search term in two different modules. Reset Procedures added to Quick Links: Reset Procedures are now available in the Quick Links bar, providing a shortcut directly to the maintenance indicator and tire pressure monitor reset procedures for every vehicle. 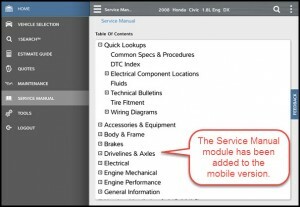 Vehicle Reference Module renamed Service Manual: Our Vehicle Reference Module has been renamed Service Manual to more accurately describe its function. You'll see this new name in the Module list and on the Quick Links bar. The Service Manual provides a drill-down method to find your information, similar to reading a printed shop manual. 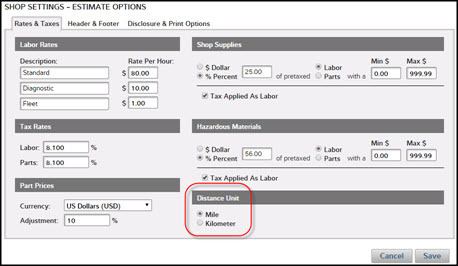 Setting for Distance: ShopKey Pro now has a "Distance Unit" setting in "Tools - Shop Settings," under the "Rates & Taxes" tab, allowing you to set either miles or kilometers as the default distance unit. When kilometers are the default setting, the odometer selection will be automatically set to kilometers and Maintenance Service Intervals in both the Maintenance and Estimate Guide Modules will be shown in kilometers. The Quick Links bar is now prominently displayed on the 1Search module, directly below the search bar. 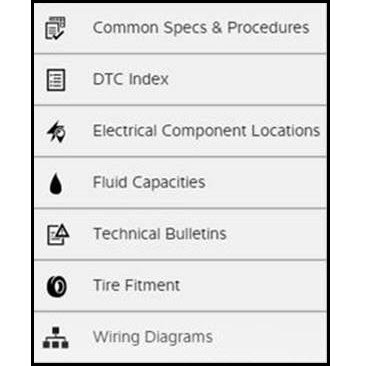 In addition to relocating the Quick Links bar to the front, center of the page, we've also changed to a horizontal orientation and updated the labels to make it even easier to access the most commonly sought information in ShopKey Pro including common specs, fluids, tire fitment, vehicle reference, wiring diagrams, DTC index, component locations, and technical service bulletins. 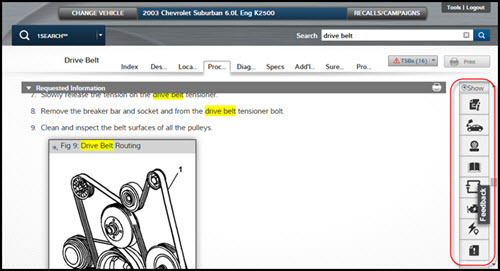 A new addition to the Quick Links bar is the vehicle reference guide, connecting you to the module of the same name. All of the service information contained in vehicle reference is formatted in a shop manual style for those who prefer that type of navigation. 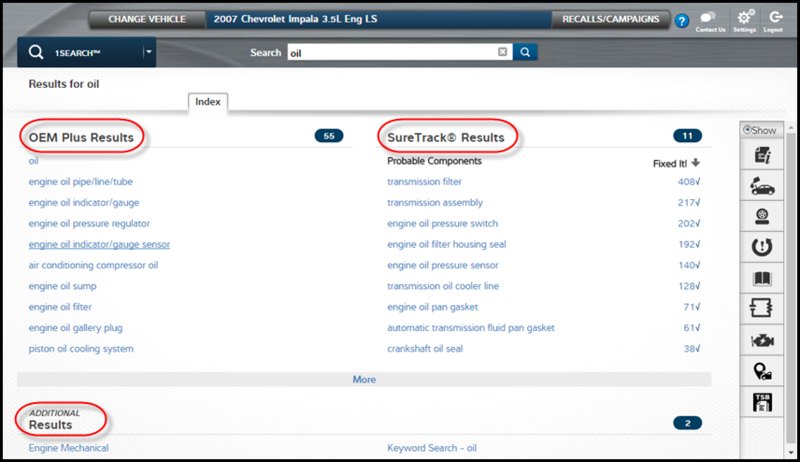 Please note that SureTrack Real Fixes and Tips are only available through the 1Search module. As you navigate ShopKey Pro using 1Search or the Top Ten Repairs list, the Quick Links bar will appear in the familiar vertical orientation on the right hand side of the screen. New Titles for Search Returns: After entering a term into 1Search, ShopKey Pro navigates to an updated search results screen. The headings of the 1Search results page have been re-labeled as "OEM Plus" and "SureTrack Real Fixes" to more clearly indicate the type of information returned. Under "OEM Plus", you'll find the component or code searched. When you select your item, ShopKey Pro navigates you to the full OEM information plus the real-world SureTrack information. Under "SureTrack Real Fixes," you'll find expert information documented from actual repair orders and experiences from professional technicians. 1Search Highlighting Now Includes Synonyms: After selecting a search term from the results page, ShopKey Pro now highlights any instances of that search term and the synonyms of that search term in the resulting data. For example: After selecting the search term "alternator," ShopKey Pro will highlight all instances of "alternator" as well as any synonyms such as "generator." This makes finding the search term in the data easier, even if the OEM term for the component is different from what you would expect. Throughout all of the vehicle data in ShopKey Pro, the OEMs have 47 different names for an oxygen sensor, such as "air fuel ratio sensor," "O2 sensor," etc. When you search for any synonym of oxygen sensor, ShopKey Pro will find that variation and highlight it for you. With visual cues to the related terms, you can see how this makes reviewing the data so much faster and easier. Highlighting of 1Search term when viewing an article: After entering a term into1Search, ShopKey Pro now highlights that search term in the article. This saves time by clearly indicating where the search term has been referenced in the article. In this release, highlighting works for the exact match of the search term. Additional enhancements to the search highlighting function are in development and will be coming soon. Select Printing: ShopKey Pro now gives you the ability to select specific, smaller segments of an article to print. You will see a printer icon placed to the right of each article heading. Selecting the printer icon will set that portion of the article to print. 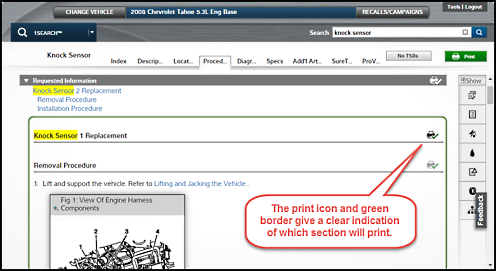 A green border will appear outlining the content, making it easy to see what will print. After selecting a section to print, the main print button on the top right of the screen will turn green. This indicates that printing can now proceed; click the green button to print. 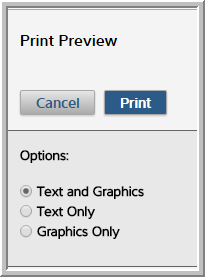 A Print Preview box will appear giving you the option to print text and graphics, text only or graphics only. Our software development team continues to make improvements to ShopKey Pro based on feedback submitted by users. We're really pleased to let you know about these latest updates - you can read about them below and please keep the suggestions coming. 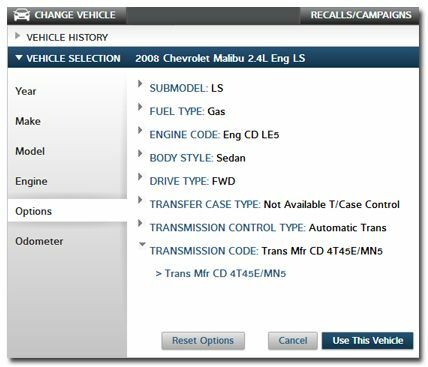 Campaigns and Recalls added to Technical Service Bulletin (TSB) Quick Links: All Recalls and Campaigns for your selected Year/Make/Model have been added into the TSB Quick Links so that you can find all three types of OEM/NHTSA notifications in one place. 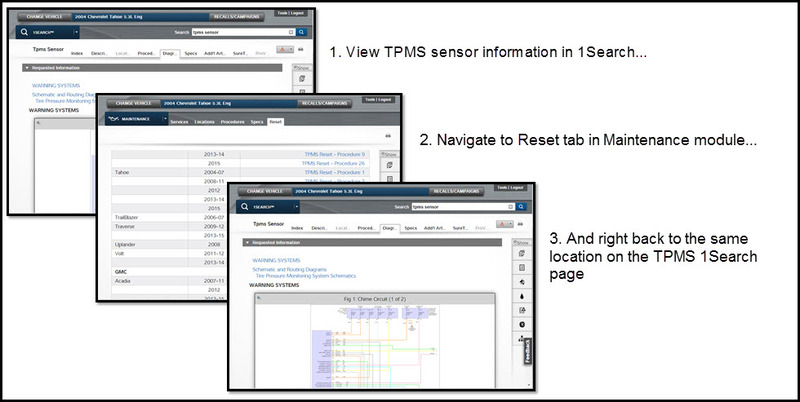 You can also use the search function in the TSB Quick Links to search all recalls, campaigns and TSBs at once. The Procedures Tab is now the default landing spot following a 1Search: After performing a 1Search and selecting a component from the OEM results, ShopKey Pro now automatically navigates you to results under the Procedures tab including removal and installation information. We've expanded our industry-leading coverage of waveform and PID graphs to now total over 750,000 graphs. The waveform and PID graphs provide known-good or known-bad comparative waveforms to aid technicians as they troubleshoot a code or symptom with a diagnostic scan tool, such as a Snap-on VERUS PRO. Waveform and PID graphs can be found under the SureTrack tab after performing a 1Search within ShopKey Pro. Click the "Waveform and PIDs" link on the left side of the page and ShopKey Pro will automatically navigate you to the tables containing the graphs. Most waveform and PID graphs are captured using the diagnostic tools a technician would use (for example, a Snap-on VERUS PRO) on the actual vehicle. The remainder of graphs in our library result from technicians uploading their real-world screen captures via the SureTrack community. This enhancement brings all the data together and simplifies the workflow, allowing you to identify and view repair information for vehicles from 1974 to the present from a single location. The extended range of model years is especially helpful for emissions testing locations to test a wider range of vehicles. Note: For model years prior to 1974, you will continue to use the Vintage button on the main menu - see below. All other model years will be accessed by using the standard ShopKey Pro vehicle selector. TSB search updated to find superseded TSBs: The TSB search in the Quick Links menu now delivers superseded TSBs so that users can easily locate references to older versions of the service bulletin. TSB links now alert you to previously read items: If you've already read a TSB, campaign, or recall during your current session, ShopKey Pro will change the color of the TSB link so that you can easily tell which TSBs have already been read. Print quality improvement: When printing a graphic in ShopKey Pro, full-size graphic printing has been improved with higher graphic quality and less pixilation in the printout. 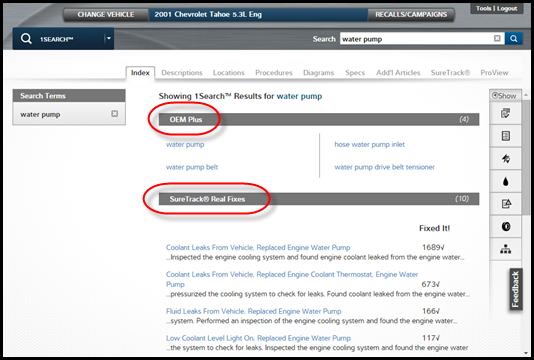 Vehicle-specific general information now showing in 1Search: Any OEM general information specific to a vehicle may now be searched in 1Search. "Lift points" would be an example of a common lookup that OEMs typically classify under general information. Quote module updates: The quote module has been updated so the experience of saved quote and selecting another vehicle with a quote open is now optimized. Our ShopKey Pro Development team has been busy this year, continuing the streak of software updates based on customer feedback with our third update this year. In this release, the team focused on navigation, vehicle qualification and more on Quick Links. Enjoy the latest ehancements and remember to keep the feedback coming! Remembering your place: When navigating between modules, ShopKey Pro now remembers your place in the previous module and tab you read, and automatically returns you to that position when navigating back. This feature is active for both the 1Search and Maintenance modules. 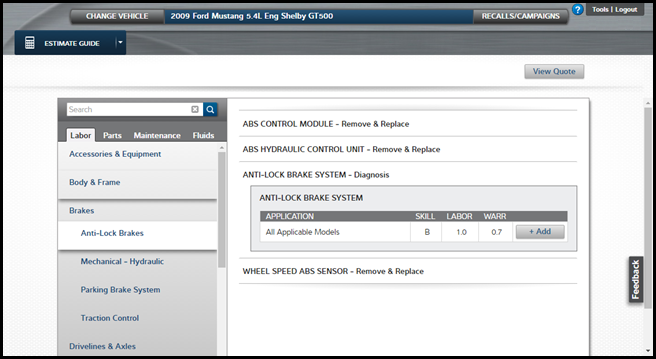 For example: You are diagnosing a TPMS wiring diagram under the Procedures tab within the 1Search module, and then switch to the Reset tab under the Maintenance module. When you navigate back to the Procedures tab, ShopKey Pro remembers the heading you had previously selected and returns you to that position. See below (click the image below to expand to full size). This will save you time by eliminating the need to re-navigate to your information. Reset Procedures for vehicle selected: ShopKey Pro now returns more relative information based on the vehicle model and sub-model selection. Previously, when you navigated to the Reset procedures tab under the Maintenance module, ShopKey Pro would show procedures for ALL models of the same make, without using the vehicle qualification to the full extent. Now, ShopKey Pro filters out information not relevant to the vehicle selected. Mouseover for Quick Links: When you hover your mouse over the minimized Quick Links menu, ShopKey Pro now shows the name of the Quick Link item. As you scroll your mouse over the icons, you can clearly see what each item contains. Automated vehicle ID information for Quick Links: The Quick Links feature requires a complete vehicle identification to function. If you have not entered all of the qualifying vehicle information, ShopKey Pro will now automatically navigate to vehicle selection and require you to input the additional information. The ShopKey Pro product development team has been working on the top issues that users have submitted into our feedback system. The latest product release reflects that effort, and includes a new TSB search, as well as improved navigation, vehicle selection and printing capabilities. Look for the team to continue providing frequent updates throughout 2015 to bring you more features based on your feedback. TSB Search added to Quick Links: Using the TSB selection in the Quick Links menu, you can now search for a specific TSB. The search looks at reference number or words in the title. Improved ShopKey Pro navigation: When switching between modules, ShopKey Pro now remembers the previous module and tab that you had read, then automatically takes you to your previous position when navigating back from another module. For example: You are reviewing information under the Procedures tab within the 1Search module and switch to the Reset tab under the Maintenance module. When you switch back to the Procedures tab in 1Search, ShopKey Pro remembers the heading you had previously selected and drops you off in that position. This will save you time by eliminating the need to re-navigate to your information. Choice between desktop and mobile versions (due 2/25/2015): If you view ShopKey Pro on a mobile device, you will now have a choice of logging in to the desktop version of ShopKey Pro instead of automatically being directed to the mobile version. If you are using a mobile device, this choice appears in a banner running along the top of the landing page, www.shopkeypro.com. 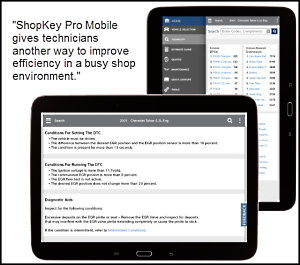 NOTE: ShopKey Pro Mobile is optimized for Android and Apple tablets. if you are using a device that is not Android or Apple (i.e. a Windows tablet), you can use ShopKey Pro by selecting the desktop version when you log in. Be sure to click "Switch to desktop version" before logging in. 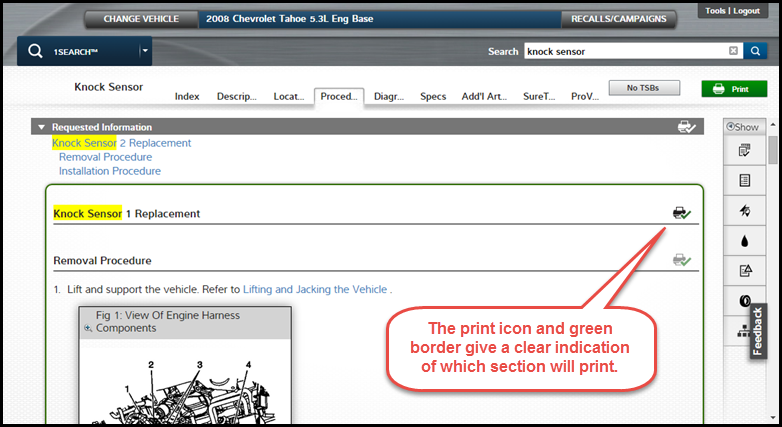 Mileage interval selected by user will print on the Maintenance Checklist: The default mileage interval to print has been changed to be the selected mileage interval in the Maintenance Module. Previously, the odometer selection was the default selection for mileage. With this change, users no longer have to click back into vehicle selection to change the odometer reading for the maintenance print selection to change. Improved zoomed print capabilities of wiring diagrams: In the previous software update, ShopKey Pro added zoomed printing for wiring diagrams allowing you to select and print a section of the wiring diagram. We've refined this capability so that what you now see on the screen will more closely match your printout. Extended column width when selecting a vehicle: ShopKey Pro now takes advantage of the full display space during vehicle selection. For example: Previously, with smaller screen resolutions, when you selected a "2010 Chevrolet Cab & Chassis Silverado," the model selection for "Cab & Chassis Silverado" would wrap onto two lines, making you think this selection was two separate models instead of one. With the improvement, ShopKey Pro now uses the full display space and the model selection of "Cab and Chassis Silverado" will properly display on one line. Wiring Diagrams - You can now print to show highlighted and hidden wires. We've also included the ability to print the diagram at your zoom level so that your printed sheet will reflect the configuration of the diagram you see on the screen. Line Drawn Diagrams - When you open a diagram within the procedures of ShopKey Pro, the diagram will now open full size without the need to zoom in. Maintenance Checklist Printing - In the Maintenance module, the checklist printout will include the selected mileage services instead of asking you to enter an odometer reading. If you enter an odometer reading, the maintenance checklist will print according to the odometer. Also, through tools a shop settings, you can set the maintenance checklist to include a custom header and/or footer so that you can include your shop information on the printed checklist you give to customers. Note: The Conversion Calculator, which had been located in the Quick Links Menu, is now found in the "Tools" Menu. 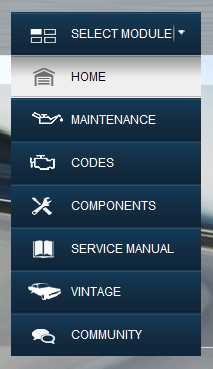 You'll also notice that we've updated the category titles in the Components and Vehicle Reference modules. When you navigate to these modules you will see that the category titles now match industry standards (and the familiar OnDemand5 category list). 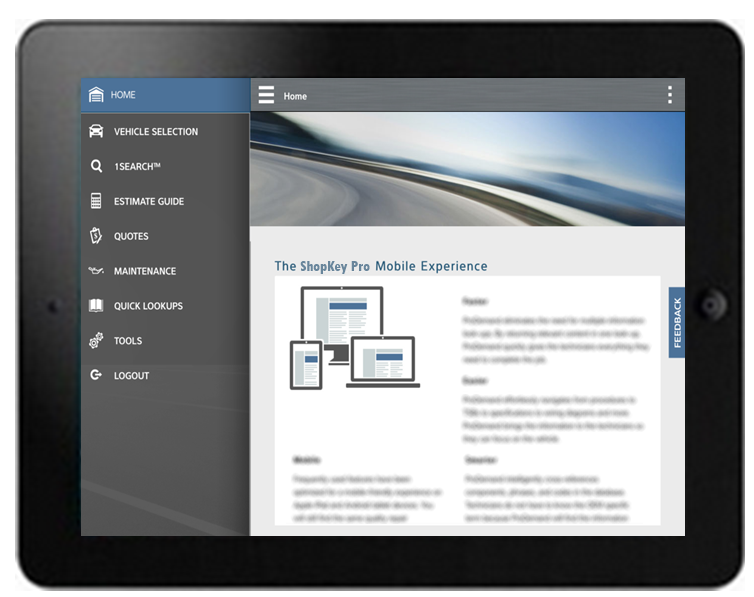 We're very excited to introduce you to ShopKey Pro Mobile, our latest enhancement to the product that allows you to access our comprehensive repair information just about anywhere you work on vehicles. The even better news is that effective immediately, we're including ShopKey Pro Mobile with your ShopKey Pro subscription at no additional charge. ShopKey Pro Mobile is optimized specifically for tablets*, making it easy to retrieve and view the repair information content right at the vehicle, or anywhere ShopKey Pro is needed. You'll find all the features you expect from a mobile device -- like swipe, scroll, drag and pinch touchscreen gestures. Just log in to ShopKey Pro from your tablet (either Android or Apple) and you'll have all the mobile functionality right at your fingertips. ShopKey Pro Mobile does not include the Component Search, Vehicle Reference, SureTrack and Vintage modules. ShopKey Pro Mobile has a few new controls for navigation, see the screenshots below. After you've navigated to a module by clicking on the module from the main menu, the name of the active module you're in will be highlighted in blue at the top. To return to the main menu, simply click that blue module button. For example, let's select Quick Lookups from the main menu. The list shown below will open. To get back to the main module list, just click the blue Quick Lookups module button. You'll go right back to where you started (the screenshot shown above). ShopKey Pro Mobile is ready and waiting for you, so log in and give it a try on your tablet... and enjoy taking your repair information with you wherever you need it! For more information about ShopKey Pro Mobile, read the blog post, ShopKey Just Got More Mobile! ShopKey Just Got More Mobile! Let's take a moment away from our text messages and Angry Birds to acknowledge that mobile computing has changed the way many of us communicate and spend our free time. Smartphones and tablets have been around less than 10 years, but we find ourselves wondering what we ever did without them. Many shops have discovered that tablet devices have high value to their business. Not only are they relatively inexpensive compared to a PC, but they also are more mobile and have longer battery life. Technicians are gravitating to having a tablet at their side instead of a printout of a repair procedure, which allows them to take their repair information source to the vehicle, right where they need it. Q: Can I access ShopKey Pro on my tablet? A: Yes, ShopKey Pro has been optimized specifically for tablet devices to give users greater ability to access repair information right at the vehicle, where they need it most. Compatible with both Android and Apple tablet devices, new ShopKey Pro Mobile supports portrait and landscape views and has been adjusted for the limited screen space that is available on a tablet device with a seven-inch or larger screen. Accessing ShopKey Pro on your tablet is very similar to how you access ShopKey Pro on your desktop computer. Simply open a browser and navigate to www.ShopKeyPro.com. As you move the tablet, ShopKey Pro will automatically adjust to the landscape or portrait view, but I suggest you use the "screen lock" feature to lock your tablet screen in landscape mode for best viewing. You can use all the "touch friendly" gestures you're accustomed to using on your smartphone and tablet: press and hold, swipe, tap, and zoom (pinch and stretch). Q: Can I access ShopKey Pro on my smartphone? A: Technically, the answer is yes. But in terms of practicality, the smartphone is really not the best device for viewing ShopKey Pro. Since the smartphone is really just a computer with a very small screen, you can still log in to ShopKey Pro; however, the graphics in ShopKey Pro have been optimized for a larger screen, so it's not the best experience to navigate and view the content on a phone. Q: Which tablets and what size tablets should I use? A: ShopKey Pro Mobile was designed for devices with a 7-inch screen or larger. 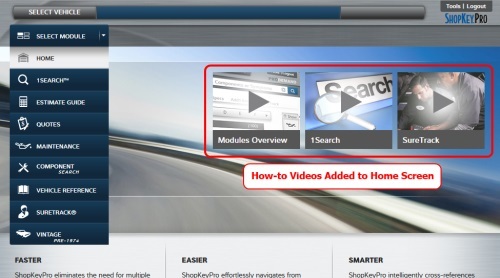 ShopKey Pro will be best viewed on a 1024 x 768 screen resolution or greater. In terms of the operating system, we require iOS 7.0 or later and Android 4.1 or later. Q: What is the best browser for viewing ShopKey Pro on a tablet? A: We recommend Google Chrome as the preferred browser whether you are on a tablet computer or a desktop computer. Q: Is there any way to get my tablet back from my 5-year-old son? A: Probably not; my best advice is to buy a new one for yourself. He'll likely take over that one and you can at least get the old tablet back! 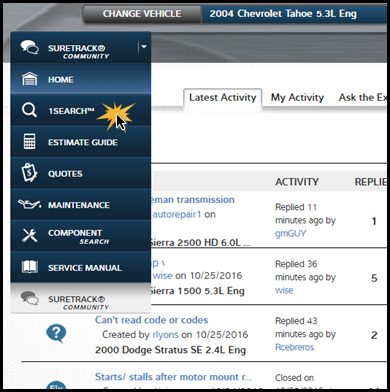 As you are using ShopKey Pro, you may have noticed the SureTrack tab that populates after completing a 1Search for your selected vehicle. If you've been hesitant to click on the tab, you shouldn't be - SureTrack offers valuable real-world content to help you diagnose even the most difficult codes and symptoms. 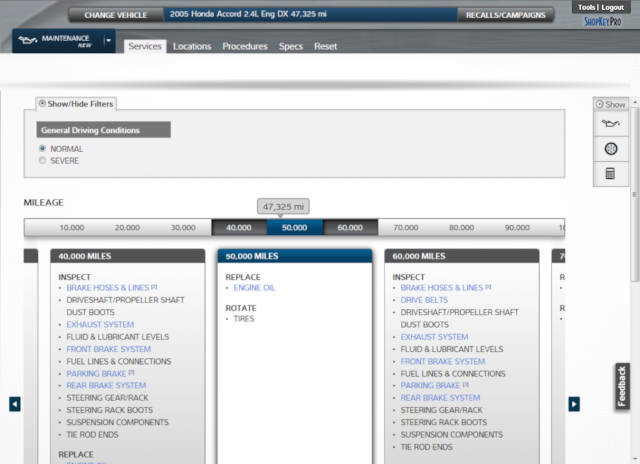 Upon selecting the SureTrack tab, the first information you'll see is the Common Replaced Parts Graph. This graph shows you the parts that have been replaced by aftermarket shops based on this specific vehicle and associated with the search term (a code, symptom or component). 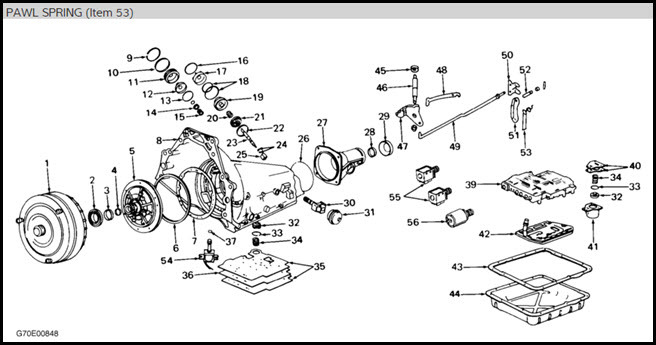 This is valuable because it allows a technician to see which parts would be the most likely source of the problem the customer is experiencing. From there, the technician can plan a diagnostic test strategy to verify the diagnosis. A Real Fix Tip is just what the name implies, a real-life, successful fix. SureTrack Real Fixes have been written by expert technicians about real-world repairs that were done in thousands of shops across the country. The Real Fix Tip is written in a "3 C" (Complaint, Cause and Correction) format. The Complaint summarizes the interaction between the customer and the service writer and includes any symptoms the customer may have experienced. The Cause captures the complete circumstances the technician experienced in determining the diagnosis. The Correction section of the Real Fix covers what the technician repaired and/or replaced to resolve the problem, as well as confirmation of the repair. Real Fixes also have a "Fixed It!" designation indicating that the information has helped at least one technician in the community repair a vehicle. With the above information, a technician can run a proper diagnosis to isolate the faulty component in order to verify the part to replace. The alternative is parts-swapping, which can lead to comebacks and dissatisfied customers. SureTrack has the most comprehensive collection of test results gathered through actual on-vehicle tests. 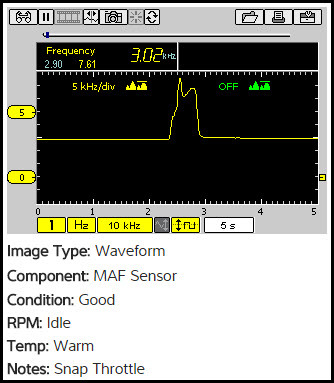 Data graphs and scope waveforms provide a point of reference to verify faulty parts. Technicians are able to compare the known good waveform vs. the reading on their scan tool and make a determination. Although not part of the SureTrack tab, the Sure Track community plays a key role in the real-world information included in SureTrack. This is where you have the opportunity to connect with other professional technicians to ask questions, provide suggestions and toss around ideas. 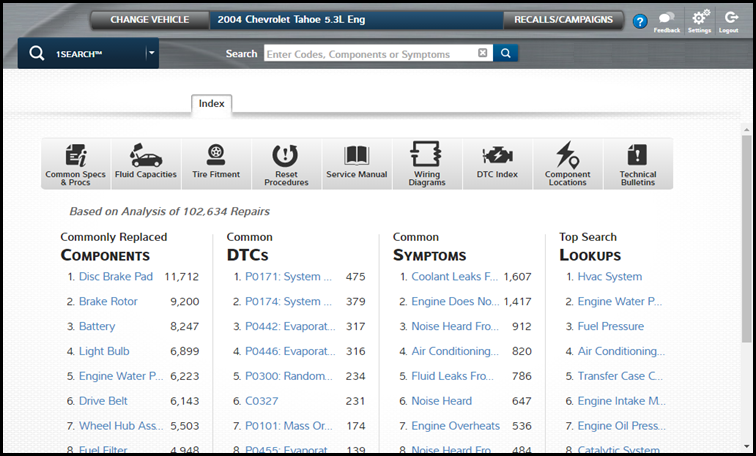 ShopKey Pro has added a unique troubleshooting tool to help service professionals relate Diagnostic Trouble Codes (DTCs) and symptoms to components. 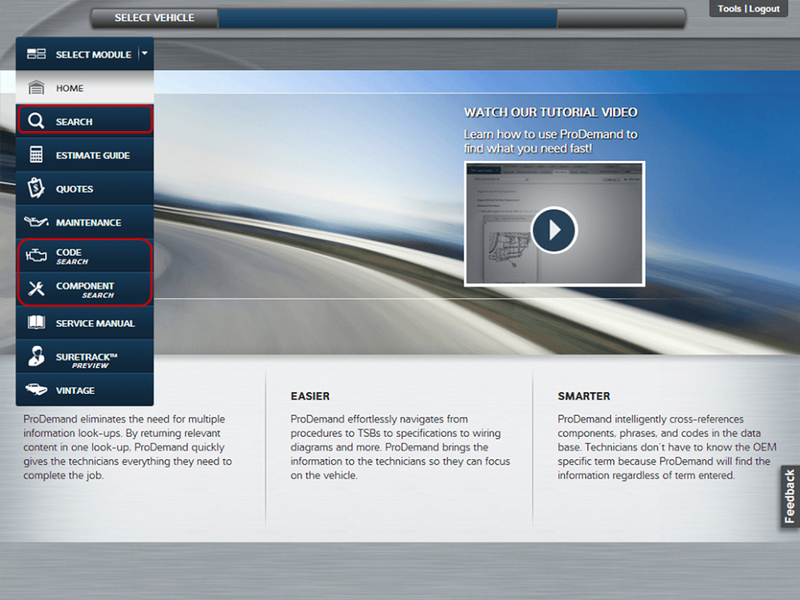 You access ProView by clicking the ProView tab (see below) after completing a 1Search and selecting a result. 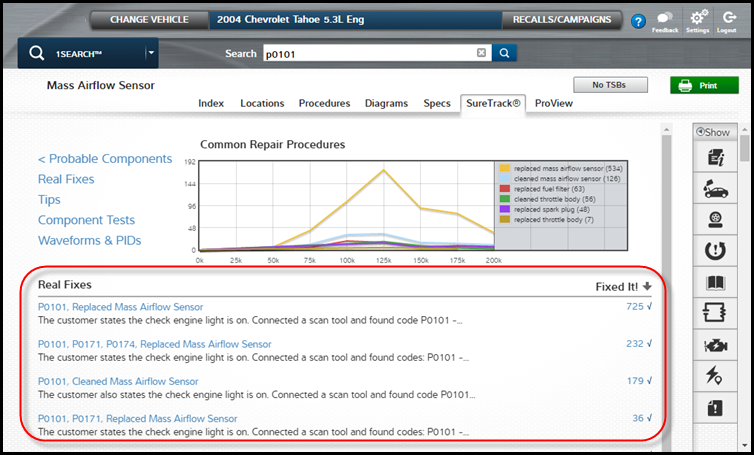 Once on the ProView tab, you can see all of the known fixed components for a code or symptom based on real-world content. 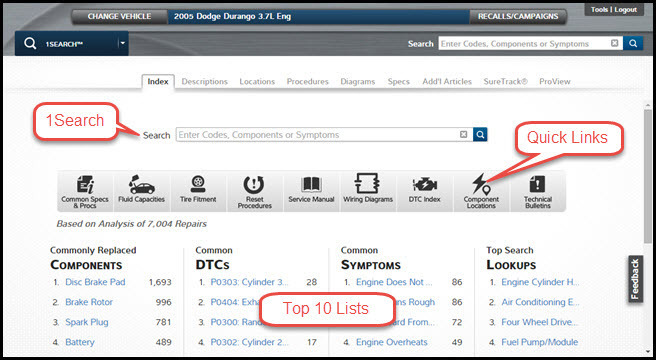 This allows you to sort by popularity of the component and plan a diagnosis strategy to resolve the problem. In figure 2 below, we've changed the code selection from a p0171 alone to a p0171 and p0174 together. Notice that the three charts have also changed, giving "Fuel Pump, Fuel Filter" as the most common replaced component for this code combination. We're pleased to announce that powerful new search technology has been added to ShopKey Pro, delivering complete OEM and experience-based information together in a single lookup. Previously, when you searched ShopKey Pro for OEM information, you then had to click into a separate SureTrack module to access diagnostic and experience-based information. Now, every time you search for diagnostic trouble codes, components, or symptoms, you will receive complete OEM information from ShopKey Pro, and the detailed parts replacement records, tips, and Real Fixes from SureTrack. 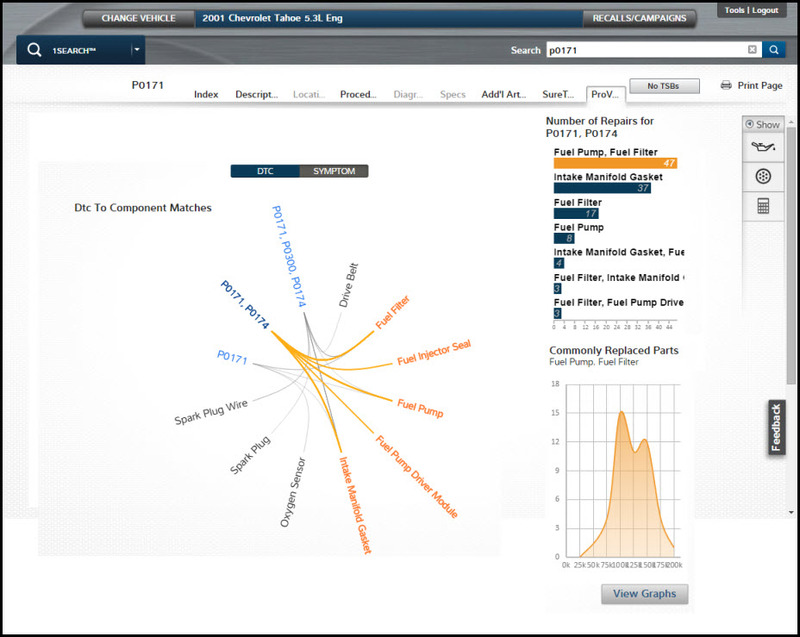 The 1Search function is included in the Search, Codes, and Components Modules. Click here for instructions on using 1Search. New interface streamlines user experience and improves access to information. There is a brand new vehicle maintenance module in ShopKey Pro. 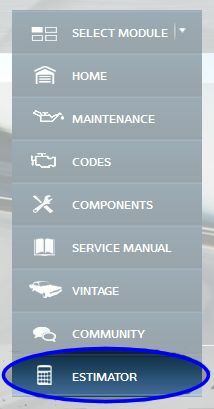 This new system makes it much easier to see all the maintenance information at a glance for the vehicle you're working on. Click here for more information and screenshots. In addition to the existing vehicle lookup tools, ShopKey Pro now lets you select a vehicle by entering the Vehicle Identification Number (VIN). This makes it easier than ever for you to connect to the correct repair information for the vehicles in your bays. The system will decode the VIN to the year, make, model and engine. 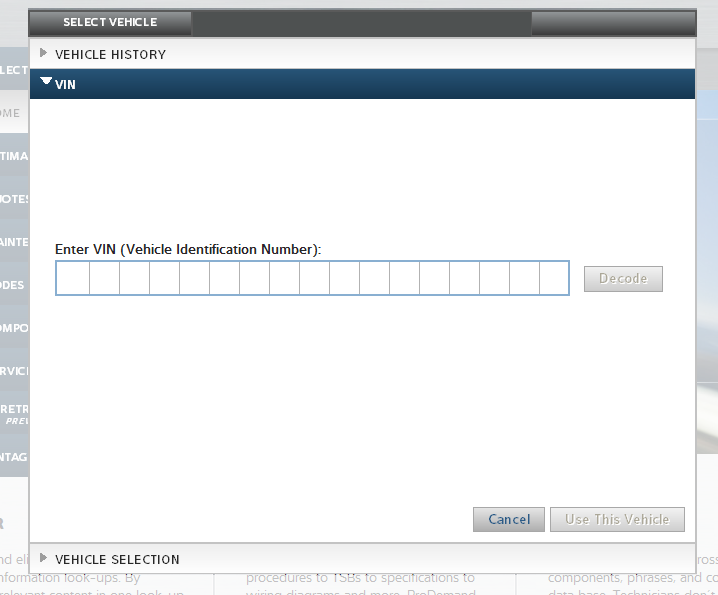 To use the decoder, click on Select Vehicle at the top of the ShopKey Pro screen and select VIN from the list. Enter the VIN in the space provided and then click on the Decode button. The decoded vehicle will appear at the top of the form. Then just click the Use This Vehicle button at the lower right to access the data for the selected vehicle. TIP: You can cut and paste the VIN into the form from another document to save keystrokes. More than 200 additional vehicle models sold only in Canada have been added to the ShopKey Pro database. Vehicles from Pontiac, Suzuki, Acura, Buick, Kia, Mitsubishi, Saturn, Nissan, Chevrolet, Dodge and GMC are included in the update. Model years range from 1996 to 2011. Specific examples include the 1996-2000 Pontiac Firefly, 2005-2009 Buick Allure and 2005-2007 Nissan X-Trail. You will see these vehicles added to the vehicle selector in ShopKey Pro, along with submodel and engine type. Full repair information including service maintenance schedules and component lookup are covered. This is part of an ongoing program to add to and enhance the data in ShopKey Pro. ShopKey Pro now includes an enhanced Vehicle Selector based on year/make/model that allows a deeper dive into vehicle attributes. When you start any look-up, year is now the first item presented, followed by make, model and engine. As you progress through the vehicle qualification process, you'll see that you can drill deeper into sub-model, engine type and transmission details. Once the "Use This Vehicle" button lights up, just click on it to continue. 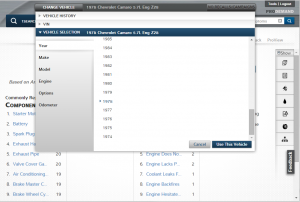 Depending on the system, you may need to select additional vehicle attributes to complete your lookup. You asked for it, and we're delivering: Estimator is now embedded right inside ShopKey Pro. You'll find it displayed on the main menu when you enter the application. This integration streamlines your workflow, making it even quicker to create your estimates. And we didn't stop there. We've added a number of new features -- like enhanced editing capabilities -- that will improve your workflow and give you more control over your estimates. Now it's easier than ever to write the estimate accurately the first time -- imagine how that can save you time! Improved Workflow: The Estimator module is now embedded directly in the application -- no need to click away from the page to complete the estimate. Enhanced Editing: You have more freedom to edit your estimate lines. You can customize the estimate by editing labor times, adding parts manually, adding or deleting lines, and moving lines in the estimate to group items together. More Capacity: You can now save up to 200 estimates, giving you expanded visibility into your estimate history. Organization: More advanced sorting capability makes searching saved estimates easier and more intuitive. Fluids: You can include fluids in the estimate: simply add a line for the fluid and enter a price; tax is calculated for you, and the estimate total displays the fluids with tax included. Better Printing: The enhanced print function allows you to suppress selected fields (like part numbers and labor hours) to customize the printout you show the vehicle owner. Expanded Browsers: With ShopKey Pro, Estimator works in more Internet browsers, including Chrome and Firefox. Watch the training video below to learn the basics of using Estimator. The first improvement you will notice is that two ShopKey Pro modules have new names, Codes and Components. Once you dig into the procedures, you'll then notice our thousands of Live Tips and real-world fixes alongside the OEM content. Live Tips: ShopKey Pro users can now access the valuable tips made popular in ShopKey. You'll now be able to read these tips and view any attached pictures or videos just by clicking on the blue "Tips" icons wherever they're available. Watch for news on an upcoming ShopKey Pro release when you'll also be able to add new tips. Codes and Components: The Repair module is now labeled Components, the place to start to find everything there is to know about any component on the vehicle. And the Diagnostics module is now labeled Codes. Start here when you already have a trouble code, and you'll find all the tests, procedures, and diagrams related to your code. Service Manual Search: The Keyword Search in the Service Manual Module now returns more results, where previously only the first 10 results were displayed. You can now filter TSBs based on category, greatly narrowing the amount of information you need to sort through to find a TSB. 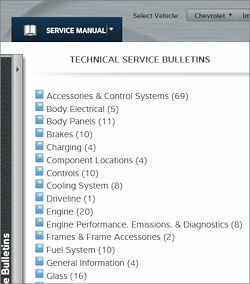 Click on the "Technical Service Bulletin" heading in the Service Manual, and you will notice the TSBs arranged by system such as HVAC or Brakes. 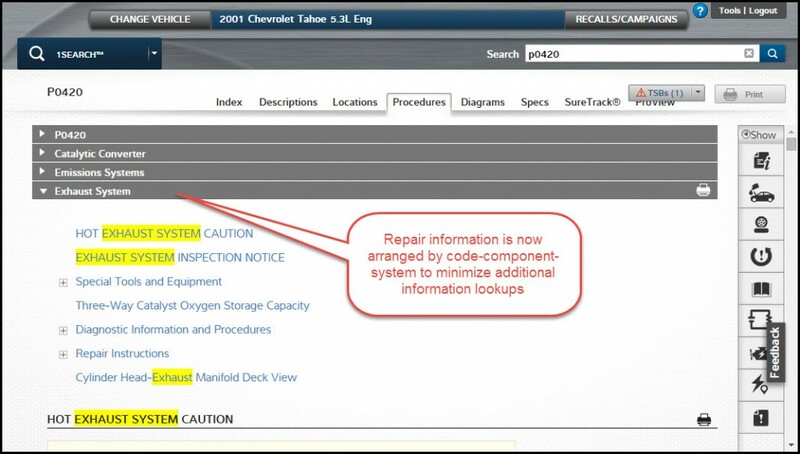 Don't forget that in the Maintenance, Diagnostic, and Repair Modules, relevant TSBs are brought back when you perform a look-up. At ShopKey, we think it is important to keep you up to date with the latest product and industry news. 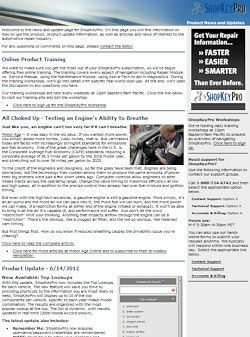 We're introducing our ShopKey Pro Blog, available on the bottom of the screen at www.shopkeypro.com. The blog will be our way to keep you informed of enhancements for ShopKey Pro as well as any services available to you such as online training. We're also going to be linking to additional industry content to keep you informed and ahead of the trends. With this update, ShopKey Pro now includes the Top Lookups for each vehicle. The new feature will save you time by providing shortcuts to the information you are most likely to need. ShopKey Pro will display up to 10 of the top components per vehicle, specific to each year-make-model combination. The results are organized with the most popular lookup at the top. The list is dynamic, with results updated in real time (2000 Honda Accord shown). Remember Me: ShopKey Pro now ensures username/password credentials are remembered. NOTE: You'll have to enter your username and password and check the Remember Me box one last time to be saved. Conversion Calculator: Quickly convert units of measure between US standards and Metric. You'll find the calculator in the quick look-up menu, shown to the right of the screen from any module. 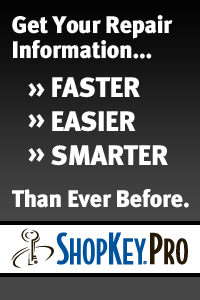 Performance: ShopKey Pro has been optimized for improved performance and faster data downloads. Better Viewing: The ShopKey Pro landing page is now optimized for 1024x768 screen resolution. It's also now easier for users to close the feedback page. Article Qualifying - further refinements in the qualifying information to the specific vehicle. Made the close button more visible when viewing diagrams. Numerous site performance related improvements in regards to IE8. Numerous bug fixes such as formatting changes, updated messages , etc. Odometer reading entry not forced on users. Users must now choose to select the Odometer entry. For any questions or comments on this site, please . (c) Snap-on Incorporated. All Rights Reserved. ShopKey® is a registered trademark used herein under license.